Born Richard Jenkins in Pontrhydyfen, Wales, Richard Burton is the archetypal seller-of-birthright-for-mess-of-pottage. He might have been one of the great actors of his day, but settled not merely for stardom but for even merer celebrity. There is still some remarkable work among the cinetrash, including Who's Afraid of Virginia Woolf (US, d. Mike Nichols, 1966), the tormented preacher in Night of the Iguana (US, d. John Huston, 1964) and as The Spy Who Came in from the Cold (d. Martin Ritt, 1965). He was famously rescued from Welsh village obscurity by the schoolmaster whose surname he took, he started on stage in 1943, went to Oxford in 1944, served with the RAF (1944-1947), and entered films in 1948 with the Welsh-based The Last Days of Dolwyn (d. Emlyn Williams). In this and several other low-key British films, such as Now Barabbas Was a Robber... (d. Gordon Parry, 1949) and Waterfront (d. Michael Anderson, 1950), he displayed a watchful brooding intensity, which attracted the interest of Hollywood where he went to star in the romance, My Cousin Rachel (d. Henry Koster, 1952), The Robe (d. Koster, 1953, the first CinemaScope film) and others. Meanwhile, he won kudos for his stage Hamlet (1953), with the Old Vic , and repeated the role on Broadway to great acclaim in 1964. The theatre, with its rigorous ongoing demands, grew less easy to accommodate to a roistering life-style which dominated world headlines when he and Elizabeth Taylor , both married to others, conducted a very public affair during the shooting of Cleopatra (d. Joseph L.Mankiewicz, 1963), a film maudit in more ways than one. The filmography hints at a man torn between the desire for prestige and the need for wealth and fame: so, on the one hand, he plays Jimmy Porter (eloquently) in the filmed Look Back in Anger (d. Tony Richardson, 1959) and the title role in Dr Faustus (d. Richard Burton and Nevill Coghill, 1967); on the other, co-starring with Taylor (whom he twice married and divorced) in The V.I.P.s (d. Anthony Asquith, 1963) and The Sandpiper (US, d. Vincente Minnelli, 1965) - and having a try for both goals at once in The Taming of the Shrew (US/Italy, d. Franco Zeffirelli, 1966). 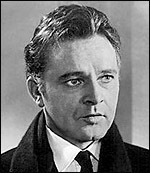 He returned successfully to the theatre in Camelot (1961), winning a New York Drama Critics Award, less successfully with Taylor in Private Lives (1983). The mellifluous voice - rather too consciously so in later years - is preserved on the original 1954 recording of Dylan Thomas ' Under Milk Wood (filmed in 1971, with Burton as First Voice). As for the rest of his British film career, there are moments to be salvaged from Becket (d. Peter Glenville, 1964, as Thomas a Becket), Anne of the Thousand Days (d. Charles Jarrott, 1969, as Henry VIII), especially from Equus (d. Sidney Lumet, 1977), as the self-doubting psychiatrist, for which he received his seventh Oscar nomination (he never won), and his last film, Nineteen Eighty-Four (d. Michael Radford, 1984, as O'Brien). In a wayward career, almost as famous for his drinking and his marriages, Burton would intermittently remind audiences of what he could do. Biographies: Rich: The Life of Richard Burton by Melvyn Bragg (1988), Richard Burton: A Bio-Bibliography by Tyrone Steverson (1992).